/dev/input/event0 does not generate anything when headphone is plugged in . and event0 device name is 'Neo1973 Buttons' , and i does response when i press AUX key . No luck with om2008.9 kernel as well . can you please shed some light on this ? end week release of fdom does depend on this feature . Did the headset event ever work on that device ? Since u-boot sets up the GPIOs, a change in u-boot may affect this. yeas , headset is OK , its the official one that i get from openmoko , and it does play music perfectly when i switch alsa states . I have tried Latest Daily uboot image and om2008 first release ( its was 24 aug , i have tried that since it was near your uboot date ) , still no output again . should show F0 if the plug is not inserted, and F1 if it is. different from F0 or F1, then this would suggest a software problem. And if it is , please provide me docs on exact detail on jack , which connector is headset detections connector ? 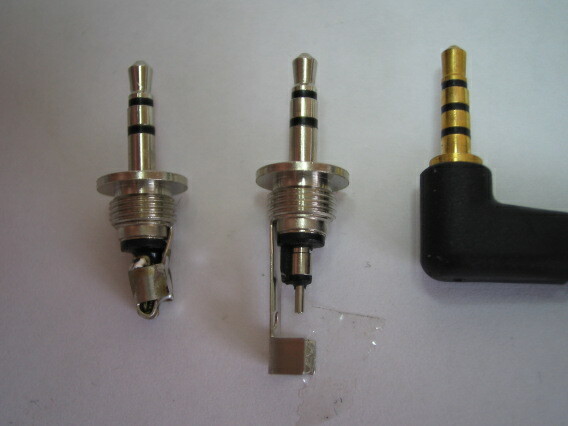 what is exact internal mechanism of jack for head phone detection ? OK! using kitchen gloves i made a hack! when jack input is facing you , the second ring of jack ( the last silver one ) has a very small golden connector to its right-down , when i insert the headphone they getting connected , when i remove headphone they are disconnected . so , is this really hardware issue ? ​http://downloads.openmoko.org/schematics/ in case you are not aware of that. interesting , its 3V when phone is NOT plugged in , and nearly zero ( very near to zero ) when nothing is inserted . 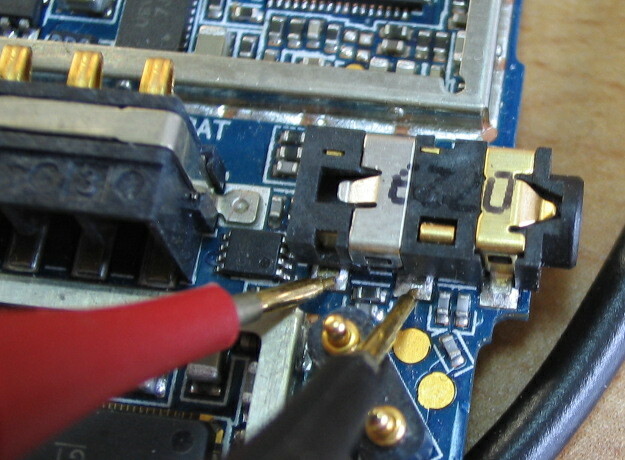 If I look at a working one, measuring the corner pin on Werner's pic (where he has the red probe) compared to 0V from the can shield, I see 0V at the corner pin when the jack is absent, and ~3V at the corner pin when the jack is in. Maybe you can triple check. It's hard to imagine that it is actually the other way around on any single GTA02. Some hard imagining is still needed anyway because the 3V / 0V transition either way should create the jack interrupt for you. So either the signal does not make it to the CPU GPIO ball, or the GPIO is blown up by ESD, or there is some queer software bug. Since we stuck a 10K in series to the GPIO I wouldn't've expected blown up GPIO. Andy you are right , after bunch of rechecking i have to confirm GPIO result , as GPIO always return F1 , i always got 3V on jack ( no matter in Headset is pluged in or not ) , the thing is , for a very short priod of Om2008 booting ( right after percent state ) there is no voltage at all on jack . so , its always 3v , no matter if headset is pluged in or not . since werner once told me that can be related to Uboot , i have to say that i have some kind of issue with it , after upgrading to om2008-update it seems that i lost my splash screen ( the image that pops up when i turn on the device ) and when i tried several times to write om2008.9 image to device ( using dfu-utils ) nothing have happened while dfu-utils shows no error , can this be related ? The measurement was in the picture was actually resistance, not voltage, sorry. Jack inserted: >1 kOhm, exact value depends on instrument. looks like a warranty case, sorry. well , isn't it as simple as simple connection that need to be de-connected ? :) two surfaces that have been forced into each other or something like this ? maybe i can reform them ? i mean , is this mechanical or electronical issue ? open, though the switch should connect when there is no plug. in the hope to dislodge the object. contacts oxydated or contaminated with something acting as an insulator. Again, seems unlikely. How to fix it: as above, but use contact cleaner. inserted into the jack's hole. discourage such attempts, unless you consider the device expendable. OK , let me know the result , if this happens before i guess i need to add something to wiki + your instruction on hardware testing , by the way , is this possible to buy jack and solder it ? acts as a large heat sink. the jack itself a tenth of a millimeter. apply too much heat to its pads, damaging the PCB. times on circuits that were much easier to work on. I see in #2084 that you've made your peace with the state of things. So let's close it as "wontfix".